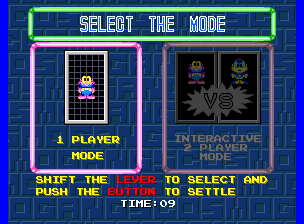 Once you have inserted a coin into the cabinet of and pressed either start button of Namco's 1992 puzzle arcade game, Cosmo Gang: The Puzzle, you will proceed to the mode selection screen shown above; you will then have ten seconds to select either "1 Player Mode" or "Interactive 2 Player Mode", by pushing the joystick left and right and pressing the Rotating Button to confirm your choice. If you chose the former, you will then have ten seconds to choose between four difficulty levels - "Easy" (Level 0), "Normal" (Level 10, starts with 50000 points), "Hard" (Level 40, starts with 1000000 points), and "Expert" (Level 100, starts out with 2000000 points) by moving the joystick up and down, and again pressing the Rotating Button to confirm your choice. Once you have pressed the Rotating Button for a second time to confirm your chosen difficulty level, a Bakuto (from Cosmo Gang: The Video) will fly off the top of the screen in his ship as the first game background appears behind the 78-square grid and he starts dropping game pieces (which could be comprised of up to three Containers, up to three Jammers, and one Ball) out of it; use the joystick to move the pieces left, right, and down (for up to 24 extra points in the case of that last one), and your Rotating Button to rotate them (in an anticlockwise direction). When you fill a line of Containers they will disappear - and when a Ball appears, note which direction that arrow is facing, for it will move in that direction when it drops (and eliminate any Jammers it hits on the way down to the bottom of the screen). 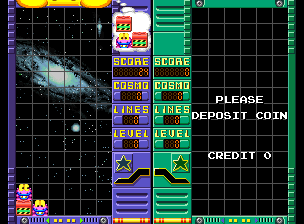 If you have chosen to start the game on "Normal", "Hard" or "Expert" level, the "Star Meter" will fill up every time a Ball eliminates a Jammer; once it is completely filled, a Star will fall down out of the Bakuto's ship up at the top of the screen and eliminate seven rows of Jammers when it lands. 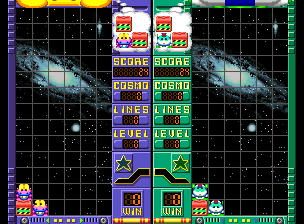 Once you have pressed that Rotating Button, a Bakuto and a big Pipopapo-Tai will fly off the top of the screen in their ships, as the first game background appears behind the 78-square grid and they start dropping game pieces (which could again be comprised of: up to three Containers, up to three Jammers or Pipopapo-Tai and one Ball) out of them; use the joysticks to move the pieces left, right and down and the Rotating Buttons to rotate them in an anticlockwise direction. In this mode, when either player eliminates a lot of Jammers or Pipopapo-Tai at once, this will not only result in a large bonus, but it will also cause a group of your side's Cosmo Gangers to fall down on your opponent's side of the screen - and once a player's pieces reach the top of the screen the other player's "WIN" counter will advance by one. You will then have ten seconds to insert another coin if you are willing to continue the game; once either of the players has won 100 games their "WIN" counter will break. This page was last edited on 13 January 2014, at 15:30.